Why just cook… when you can cater for your friends and family? Adding two vertical warming cupboards to your Cluny affirms the decision to plant deep roots in your community. Your Cluny 1800 sitting at 71 1/16″ can handle it all. Your home has now become the epicenter of relationships, bringing friends, family and neighbors together in culinary communion. No worries! Prepare dinner ahead of your guests’ arrival. Enjoy their amazement as you calmly serve up to twelve hot, plated entrées from each vertical warming cupboard. Being as fully equipped as your neighborhood bistro or café heralds the beginning of countless healthy and savory evening gatherings. 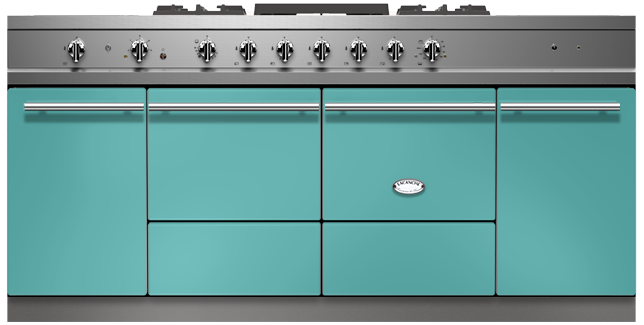 Click the button below to configure a Cluny 1800 moderne that is perfect for your kitchen. The ovens found on the Cluny 1800 are 16w x 12h x 18d. The warming cupboards are 13w x 20h x 21d. Your choice! You may choose to make the ovens both gas, both electric, or one gas and one electric. *Convection is not an option for the Cluny models. Our matte black finish is considered to be standard, and all other color finishes, including stainless steel, are considered to be premium color finish upgrades. The color upgrade charge for a Cluny 1800 is $1600. There are four options: brass, brushed stainless, chrome, and nickel. Brass is considered “standard” and there will be no upgrade charge. The trim upgrade charge is $600. A. For the Cluny 1800 model, choose an overhead canopy with the following optimum specifications: 80″ wide (86″ wide for Cluny 1800 island installations) x 24″-27″deep. B. Blowers should be rated at 1200-1600 cfm, with 12″ round ducting, or equivalent. Size should be measured by the style and quantity of cooking, i.e. Asian stir-fry (vaporized grease) requires higher performance blowers than French reduction (steam). Please view here for more detailed ventilation guidelines.